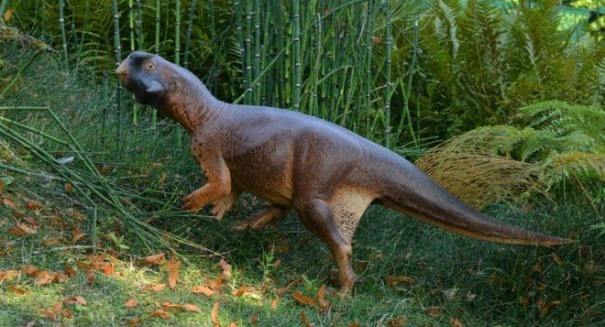 A bizarre dinosaur that lived 100 million years ago in Asia is catching scientists' attention. A tiny “parrot dinosaur” named Psittocosaurus that lived 100 million years ago and was about the size of a dog is making waves in the scientific community. This little cousin of the Triceratops is helping scientists come to some amazing conclusions about the evolution of camouflage. The dino, which is being referred to as a parrot-like dinosaur because of its beak, also sports some unique camouflage. In a study published in the journal Current Biology, scientists examined a fossil specimen that was preserved so well that it still had skin that could be examined for color patterns. The dinosaur had a lighter underside than its back, much like animals that live in the water, like penguins or the Great White Shark. This makes it hard for animals underneath to see them contrasted against the bright sunlight, and it makes them difficult to see from above as it is hard to pick them out from the dark background. But how would this benefit an animal on land? As it turns out, quite well. Scientists created a model of Psittacosaurus and then determined how different camouflages would affect the animal. They found that this camouflage was the most effective for an animal living in the forest.